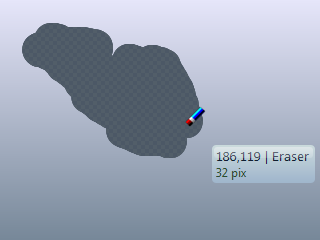 The eraser allows you to make pixels in a layer transparent, thus erasing them from the image. You also have the option of making them white instead. Using the right mouse button (or holding shift) makes the pixels slightly more transparent than they were, as dictated by the level setting. Using the left mouse button makes the pixels completely transparent. This tool is pressure sensitive when using a graphics tablet; the pressure varies the width of the tool tip. This option makes the brush-tip rounded with configurable soft edges. This option makes the brush-tip square with hard edges. This option makes the brush-tip rounded with configurable soft edges, and makes it erase to white. This option makes the brush-tip square with hard edges, and makes it erase to white.